Mobile Mfg. Company is very pleased to announce two new sawmill models “1206 and 1210”. These models have been in the design stage for over 5 years. 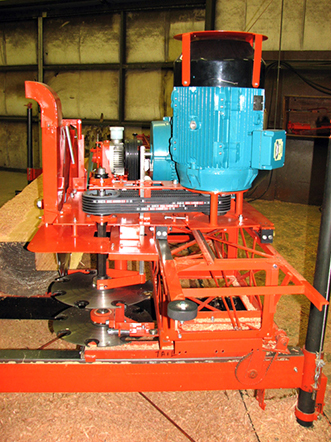 We have utilized all of our past experience in manufacturing portable sawmills to make this new larger and more productive model. More bracing, larger, stronger and more wear resistant parts to give you a very high production sawmill. In production runs, these new models have almost doubled the production of the model 128 electric. It has a maximum cutting speed of 8 seconds to saw a 16 foot (4.8m.) board and return it. The two large edger saw blades give you a maximum cutting size of 6 ¼ inch (15.88cm.) x 12 ¼ inch (31.1cm.). 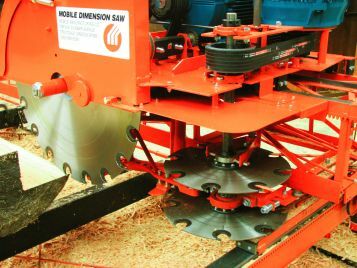 The single larger edger saw blade allows a cut of 10 ¼ inch (26cm.) x 12 ¼ inch (31.1cm.). Two 25 hp electric motors give more power to increase both the maximum cut size and the faster feed rates. Shown is the 30 inch (76.2cm.) main saw blade with 18 - ¼ inch (.635cm.) saw teeth. The two 16 ¾ inch (42.5cm.) edger saw blades have 8 – ¼ inch saw teeth. The model 1210 also comes with a 24 - ¾ inch (62.86cm.) 8 tooth 5/16 inch (.793cm.) saw tooth blade. The 1206 and 1210 models are wider and longer. End stands have to be 12 inch (30.5cm.) wider in width in order to cut the same diameter logs that the models 12XLS and 128 could saw. The track has to be 2 feet (61cm.) longer to cut the same length logs as the other mentioned models. End stands at 4 foot (1.22cm.) in height are 9 feet (2.75cm.) in width to saw 4 foot (1.22cm.) diameter logs. 20 feet (6.1m.) of track will saw logs up to 14 feet (4.26m.) in length. Aluminum frame with multiple voltage and cycles, 3 Phase. Motor control panel, start-stop and safety switches. Control and power wiring included from control panel to saw motors. Edger saw blade 24 ¾ inch (61cm.) 8 tooth – 5/16 inch (.793cm.) kerf. Standard track is included with both models. 20 feet (6.09m.) Two 10 foot (3.048m.) sections. to length of saw log. Automatic neutral at start. board feet (14M3 – 42M3) per 8 hours.